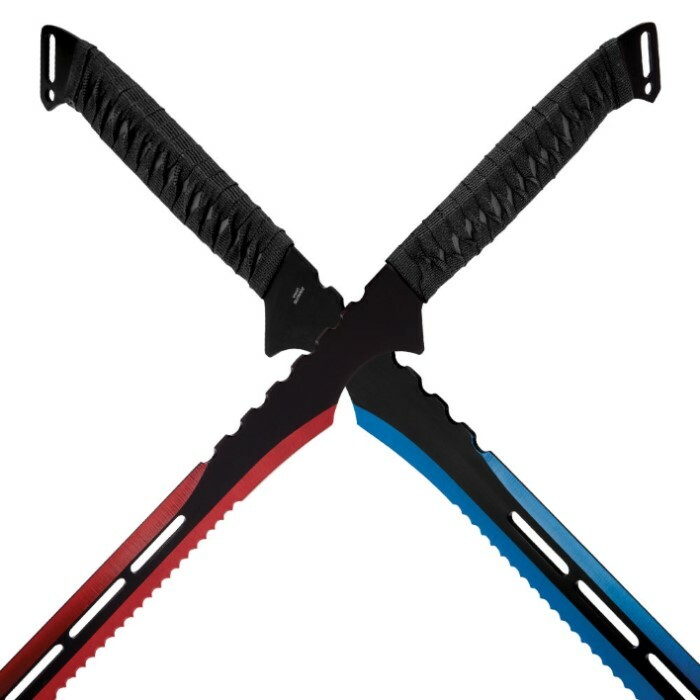 Two equally menacing black fantasy-style swords, one accented with gleaming iridescent cobalt blue spine and edges, the other deep, dazzling crimson, make the Fire and Ice Twin Sword Set impossible to resist. The two seriously sharp swords complement each other perfectly and both have carefully honed 19 1/2” stainless steel blades with partial broad, rounded serrations. They are just the right balance, size and weight for simultaneous, one-in-each-hand use. The durable, water resistant black nylon rope-wrapped handles make them easy and comfortable to wield. 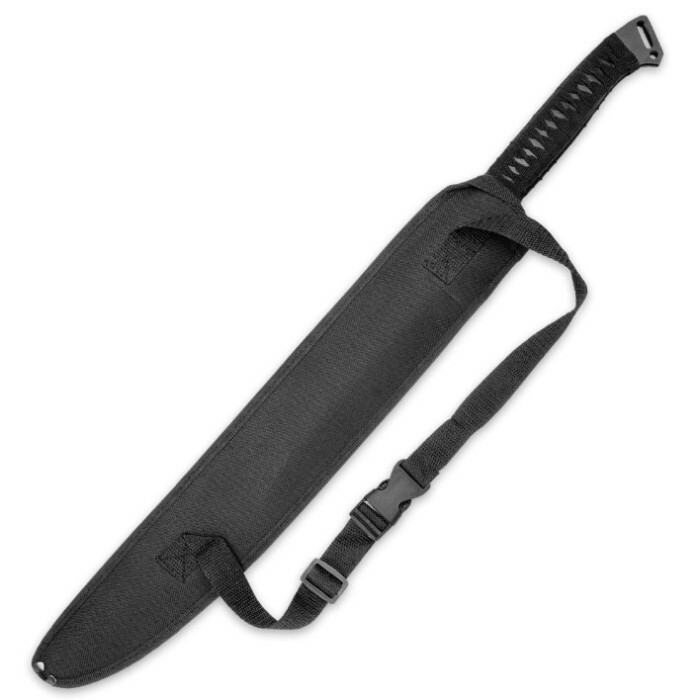 The set includes a handy, protective nylon two-sword sheath with carrying strap. 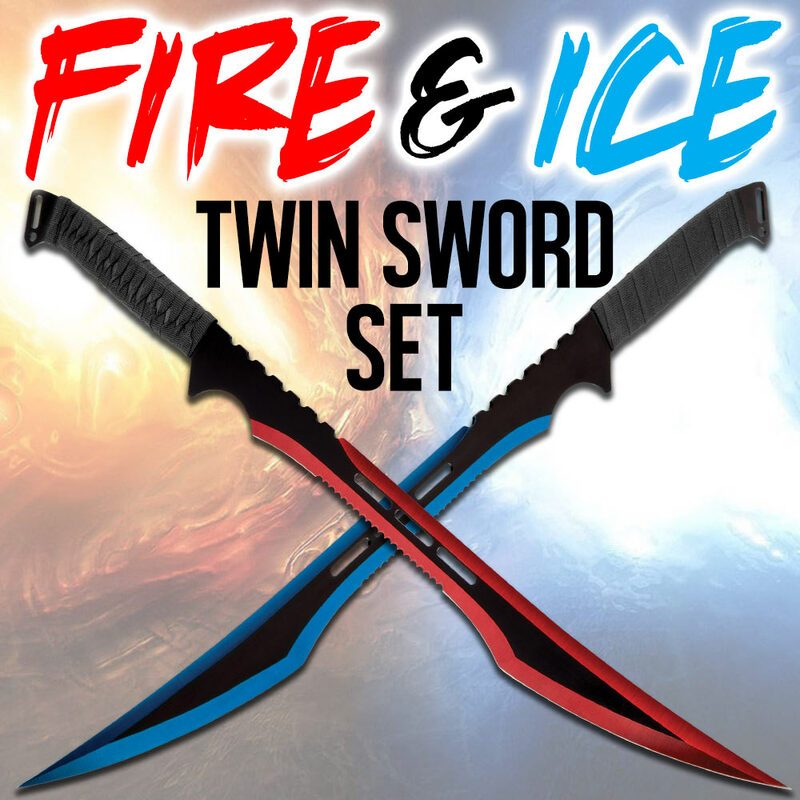 If you don’t yet have a twin sword set in your collection, the Fire and Ice Twin Sword Set is a terrific, affordable place to start. These swords are lightweight and easy to handle. They have a very durable blade on each sword. I bought these swords when they were first new they are still very sharp after being used a lot they are my go to sword for cutting bottles and anything that i want to cut they are a must get twin set and the price is phenomenal!! The swords came pretty sharp. They held an edge, but through rough teats, the tip best on one of them, and the grip was messed up. The grip is just glued on in two spots. The sheath is pretty neat, but its hard to open. Overall, they are god swords.